New York officials responded swiftly to Tuesday’s terror attack in the city. A 29-year-old Uzbekistan immigrant, identified as Sayfullo Saipov, drove a Home Depot rental truck into a pedestrian and bike path on Tuesday, killing eight and injuring 12 others, CBS News reports. The attack was the deadliest one to occur in the city since the September 11 attacks in 2001. After Saipov crashed the rental truck into a school bus, he got out and brandished what looked like firearms, according to CNN. 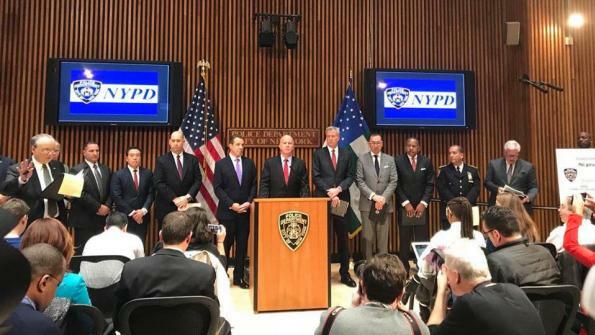 During this time, New York Police Department (NYPD) First Precinct Officer Ryan Nash, 28, was on a call to find an emotionally disturbed person, the New York Post reports. When Nash saw Saipov exit the vehicle, he gave chase, shot Saipov in the abdomen and brought him down. Nash has received much praise for his actions. New York Mayor Bill de Blasio thanked the NYPD and other first responders for their actions, “starting with the officer who stopped this tragedy from continuing,” per CNN. He also condemned the attack, calling it “a particularly cowardly act of terror aimed at innocent civilians, aimed at people going about their lives who had no idea what was about to hit them." "He is a hero, there is no doubt," New York Governor Andrew Cuomo told CBS This Morning the day after the attack. Overnight, police searched the suspect’s home in Paterson, N.J., looking for clues associated with the attack, the Wall Street Journal reports. A note found in the truck after the attack confirmed that Saipov acted in the name of ISIS, per CNN. As the New York City Marathon approaches on Sunday, police have announced they will be deploying more blocking vehicles and counter-sniper teams for the event, the Washington Examiner reports.